Hello everybody.im 33 would like to try rock climbing .can guys tell me how and where i can start and try it.Thanks for info .. 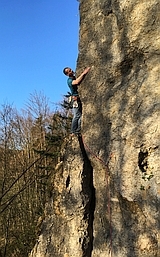 I'm also new in Prague and looking for a climbing partner. Hey everybody! What are the best places to do indoor climbing or bouldering in Brno? Maybe you know if somebody is organizing bouldering lessons as well? Hello I will be in Prague July 20 for one week. I would like to climb outdoors for several days. I am willing to travel / camp to any area to experience a few of climbing in Czech. Or go bouldering too. I am looking for a partner. my name is Karolis and I will be visiting Prague/Petrohrad/Pilsen, mainly for bouldering in the Petrohrad region. I'll be grateful for any advice.